That’s a nice touch – “Sunshine Bakery CA” – makes you think of, well, California of course. It really means Chapel Allerton, a nice trendy, young professional type of place in the northern suburbs of Leeds, West Yorkshire. As well as a few good places to eat [See the post on The Mustard Pot] there’s a whole selection of real shops that you just want to go in to, including a rather nice cheese shop called George and Joseph – we’re looking forward to a selection from here over Christmas. A proper village sort of a place then, including a bar called “Further North“, the sister to the famous NorthBar in Briggate in Leeds. Report shortly. 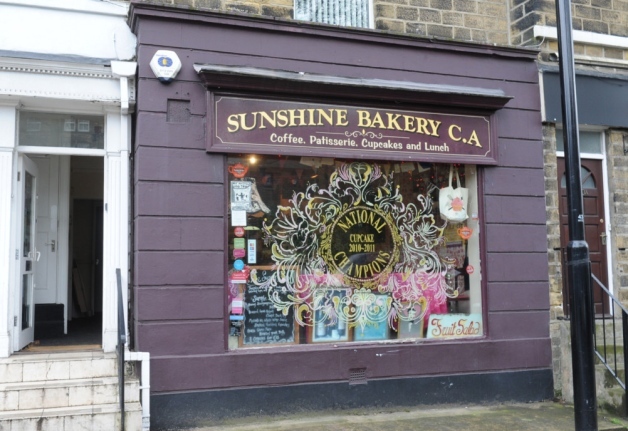 However, this is about the Sunshine Bakery, run by David Bennett, former chef for Marco Pierre White. First and foremost it’s the place to buy your cupcakes – wonderful, towering creations available singly or in boxes of any number you like – good for wedding cakes apparently. More importantly [for us anyway] is the little – about four tables – restaurant they run on Thursday, Friday and Saturday evenings. It doesn’t feature on their website but is a sort of secret table kind of place – a supper club if you like. Simple but very tasty menu and, when we went, you take your own wine. All very civilised. The website lists the opening times at 10:00-18:00, but it’s 22:00 on Thursday-Saturday. Top secret then.